Burnley goalkeeper Tom Heaton was lost for words following boss Sean Dyche’s 300th game in charge. 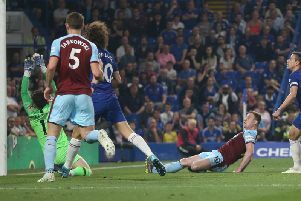 The 47-year-old’s tenure at Turf Moor went full circle with the Clarets recording a 2-0 win over Wolves, as they had done in his first game at the helm. Dyche is now the second longest-serving manager in a job in the Premier League, he’s enjoying the fourth best stretch in England and, post war, only Harry Potts and Stan Ternent boast better numbers at Burnley. The Clarets boss has won 114 of those games in charge, drawing 84, and has guided the club to two promotions from the Championship and a first European expedition since the 1966/67 season. “It’s difficult to put in to words, it’s an incredible achievement in this day and age,” said the skipper, who was Dyche’s first signing. “When I signed we were the third favourites to get relegated, a lot has been made of that and where we are now and where we’ve been fighting. “The club’s evolving off the pitch too, a lot of that is down to him. It’s a brilliant day for him and he should be very proud of that. “I missed the first six months. It’s been an incredible journey, even the year we got relegated out of the Premier League, it still felt like we were building forwards and that’s down to him. Hopefully, that can continue. The England international hailed the doggedness of the home side’s performance as they fought tooth and nail to keep Nuno Espirito Santo’s FA Cup semi-finalists at arm’s length. The Clarets kept their first clean sheet since mid-January’s goalless draw against Watford at Vicarage Road to secure a valuable three points in the fight for survival. After ending a run of four defeats, Heaton said: “I think it was a tough scenario coming in to it with us being dragged in to a relegation area on the back of four defeats. “I thought we embraced it and there were some big performances out there today from back to front. “Charlie Taylor I thought was immense at left-back dealing with the pace of Traore. Ben and Tarky were superb again. Some match winning blocks - one each for them two that I can think of. “Bardo at the back stick winning headers, but I think you can go beyond that. Dwight, Corky and Westy - the shift they put in there was massive. Having moved five points clear of his former club Cardiff City, he added: “A lot of credit needs to go to them, you can see that the application out there was top draw. “That’s what you need when you’re in the situation that we were in, it’s not all about playing nice football, sliding the ball around. We need that doggedness and we had that in abundance. “They are a good side, their league position doesn’t lie. They are a very good footballing side, you can see that. I thought we took the game to them, so I’m proud of that today. “We’ve been on a tough run, there’s no coming away from it. We’ve put in some decent performances, but there’s a lot of noise coming from the outside. “You try to shut it out, but it’s difficult. They’re talking about relegation and the tough run in. We needed that good performance today, that sort of attitude. “If it hadn’t have gone our way, we’d have dusted ourselves off and gone again Monday morning - that’s just how we are.